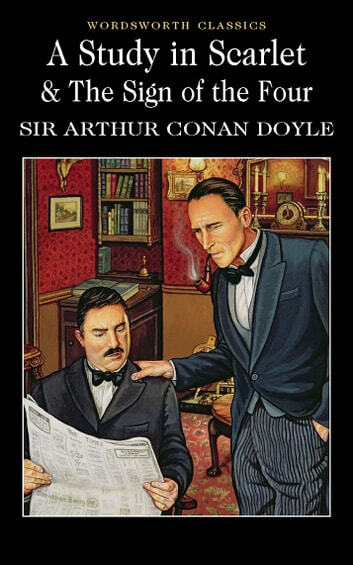 'Doctor Watson, Mr Sherlock Holmes' - The most famous introduction in the history of crime fiction takes place in Sir Arthur Conan Doyle's A Study in Scarlet, bringing together Sherlock Holmes, the master of science detection, and John H. Watson, the great detective's faithful chronicler. This novel not only establishes the magic of the Holmes myth but also provides the reader with a dramatic adventure yarn which ranges from the foggy, gas-lit streets of London to the burning plains of Utah. The Sign of the Four, the second Holmes novel, presents the detective with one of his greatest challenges. The theft of the Agna treasure in India forms a catalyst for treachery, deceit and murder. With these two classic novels, A Study in Scarlet and The Sign of the Four, you have the brilliant foundation of the Sherlock Holmes canon. Reading pleasure rarely comes any finer.